This is a question from a site visitor with an unusual situation. A dryer outlet exists, but no outlet for the washing machine. I have a single 30amp 220v circuit for a dryer. Is there a way to wire a 115 v outlet into that circuit at the outlet for a washer? I’m assuming that you want to be able to have both the washer and dryer connected and operable. 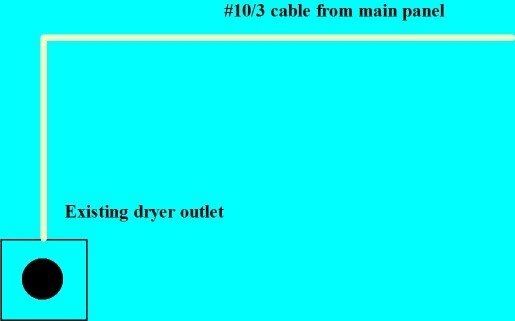 I’m not sure why a dryer outlet is present without a circuit for a washing machine? Regardless of that, here are some options. If you can find a way to get a new cable from the panel to the location of the washer, this is the most desirable solution. Nothing is impossible, but due to many factors, it can be an expensive and messy proposition to get a new circuit in to an existing and finished structure. I would consult a good, experienced residential electrician to see if they can help you with a course of action. Now if you’ve determined for whatever reason that a new cable and dedicated circuit is not possible, here is what I would suggest as a solution. The cable for the dryer outlet should be a #10/3 cable (red, black, white, and ground), fed by a 2-pole 30A breaker. If the cable can be moved to an acceptable location for a small, 4 circuit sub-panel within the room, then you could use this existing cable to feed this sub-panel. Then from the sub-panel you could run another 10/3 cable to the dryer outlet, and a 14/2 cable to the new washer outlet. 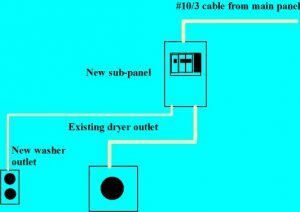 You would then feed the dryer outlet with a 30A 2-pole breaker, and the washer with a 15A, 1-pole breaker from the sub-panel. You would have to be careful to run only one of the appliances at a time, but should you forget and try both, the breaker feeding the sub-panel from the main panel would (and should) trip out, reminding you not to do that. As I mentioned, this is not the best solution, but is a safe option providing that you ensure the breakers and wire sizes are all properly matched, this is a workable solution to your problem. This entry was posted in Home Electrical How-To, Q & A and tagged 1-pole breaker, 15 amps, 15A, 15A breaker, 2-pole breaker, 20A breaker, 30 amps, 30A, breaker, cable, dryer outlet, outlet, receptacle, sub-panel, subpanel, washer outlet, wire. Bookmark the permalink. Electrical, Plumbing or Design Decisions – Which Comes First?